Will We Let Ukraine Die? WASHINGTON, DC -- A Ukrainian military unit last week released footage from a drone showing a large new Russian military base in eastern Ukraine, equipped with T-72 tanks, barracks, communications equipment and even a parade ground. 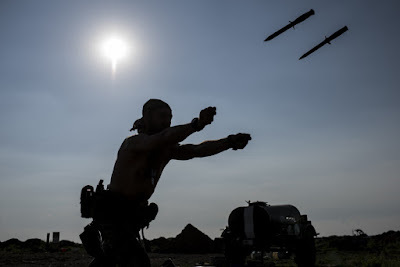 A Ukrainian soldier throws knifes during a training at the frontline in the village of Krymske, east Ukraine. International observers reported “increased intensity” of fighting in the region, in violation of a cease-fire. Russia meanwhile suspended gas deliveries to Ukraine, thwarting its attempt to stockpile supplies for next winter. In Washington, a committee of Ukrainian bond-holders, led by several U.S. hedge funds, resisted an International Monetary Fund-backed plan to reduce the government’s debt burden so that it can avoid a default. Ukraine’s democratically elected and fervently pro-Western government faced all these trials essentially alone. German Chancellor Angela Merkel and her European Union partners are preoccupied with the crisis in Greece; Barack Obama is intently focused on completing a nuclear bargain with Iran. Western governments have taken no new action either to prevent a new Russian military offensive this summer or to provide Ukraine’s government with the funds it needs to survive through another year. Will this be remembered as the summer when the West let Ukraine die? The figment of a strategy embraced by the United States and the European Union calls for the implementation of a peace plan, known as Minsk 2, that Russia accepted in February but has never respected. U.S. officials regularly agree with their Russian counterparts that the fighting should stop and agreements should be reached on implementing other parts of the deal; meanwhile, the estimated 9,000 Russian troops in eastern Ukraine — whose existence Moscow denies — continue to lay the groundwork for another major attack. Analysts Pierre Vaux and Catherine Fitzpatrick of the Interpreter Web site have identified two new Russian bases near the front lines in recent months, including the one filmed by a drone. They are positioned so as to support an offensive against the government-held city of Mariupol, which is the strategic key to southeastern Ukraine. “The time for such an attack may be drawing nearer,” Vaux reported last week in an article for the Daily Beast. Similar warnings have been sounded by other experts, including an Atlantic Council mission led by former NATO commander Wesley Clark. Secretary of State John F. Kerry is still talking about the moribund Minsk deal. Obama turned aside the latest request by the Ukrainian government last month for defensive weapons that might blunt a Russian attack, including anti-tank missiles. The European Union recently renewed its economic sanctions against Russia, but declined to react to Moscow’s brazen cease-fire violations and continuing military buildup. Obama and Merkel argue that aiding the Ukrainian army wouldn’t prevent a Russian attack and might provoke one. Their logic is dubious: Russian analysts say that Vladi­mir Putin has reason to worry about the casualties a strengthened Ukrainian army could inflict. In any case, the military arguments don’t explain the West’s passivity on the economic front. Economic output has fallen by more than 15 percent in each of the past two quarters. The government has imposed drastic austerity measures, including a huge cut in the subsidy for gas and a big reduction in pensions. Unlike Greece, it has taken every painful austerity step required by the International Monetary Fund, even while fighting a war. Yet the European Union, which has committed $222 billion to bailing out Greece, has offered Ukraine $5.5 billion. The United States, which provided $20 billion to save Mexico from default and $18 billion for reconstruction in Iraq, has approved $3 billion in loan guarantees for Ukraine. The paltry sums have placed the Kiev government at the mercy of foreign creditors holding $19 billion of its private debt — including the Russian government, which holds a $3 billion eurobond. Outside of Moscow, the biggest bondholders are U.S. hedge funds, including bottom-feeder Franklin Templeton. To meet the IMF’s plan, the government must extract $15 billion in relief from them over four years. But Franklin Templeton and its partners have refused to accept a reduction in principal, despite prodding from the IMF and the U.S. Treasury. That leaves Ukraine facing the possibility of default as soon as the end of this month, and no later than September, when a $500 million bond falls due. Anders Aslund, an expert on the Ukrainian economy at the Atlantic Council, thinks Ukraine needs $10 billion in additional financing to survive the next two years. At best, it may get half of that. Ukrainian leaders, who see themselves fighting in defense of Western democracy against Putin’s imperialist autocracy, increasingly express bewilderment at their inability to attract support. But the free world, it seems, is otherwise occupied.